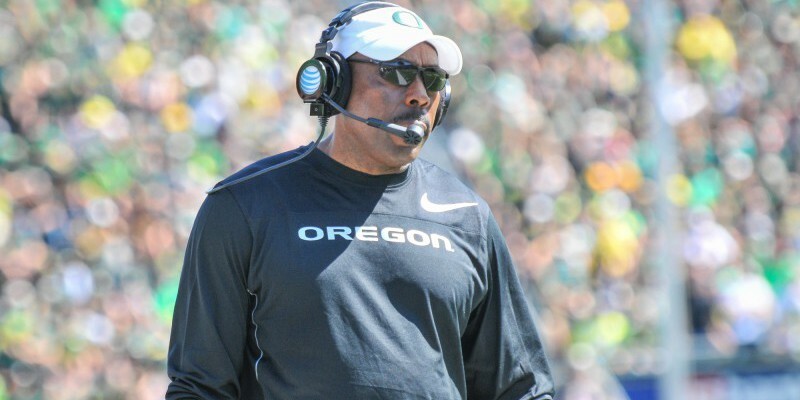 It was reported by 247sports two days ago that LSU might have some vested interest in Oregon Defensive Coordinator Don Pellum. While Duck fans should not worry about Pellum making any decision in the very near future (he is obviously focused 100% on Ohio State right now), should we be worried about Pellum leaving after the season is over? Coach Pellum has been with Oregon for over 20 years. Most recently, he was the linebackers’ coach, and upon the retirement of long time D-Coordinator Nick Aliotti, Pellum was offered the job. This did not come as much of surprise, as Oregon typically likes to hire from within. Many people were worried about Pellum’s ability to put together a group of guys that could compete and be physical, but he has more then passed the test. Pellum currently makes a salary of $400,000. While this is not a number to scoff at in terms of how much a good D-Coordinator gets paid, it certainly is not at the top. Recently, former Florida Gators’ Head Coach Will Muschamp accepted an offer to become the D-Coordinator for Auburn. His salary has been reported at $1.6 Million. With all that being said, Pellum seems like the kind of guy that LSU would go after to fill their open D-Coordinator position. He has done a great job this year forming a defense that is physical and incredibly opportunistic. In addition, Pellum has forged a great relationship with Head Coach Mark Helfrich and that relationship has resulted in success on the field and, he has recruited a great class for next year. While Oregon will probably take a look at the contract of Coach Helfrich, they will probably need to look into Pellum’s as well. It will be interesting to see what happens since we all hope the entire coaching staff ultimately decides to return for another fantastic year of Duck football. It’s a little more then 48 hours until game time in Dallas. With a lot of information being released about both teams, FishDuck.com is the place to be.